Buried deep in their Washington Post review of the lessons of Watergate, Bob Woodward and Carl Bernstein made a remarkable admission: that they’ve failed to solve the Watergate break-in. After all this time, they still can’t tell us who ordered the burglary of Democratic National Committee headquarters in 1972—or why. This failure—which I wrote about here in April—doesn’t diminish my admiration for the courageous, groundbreaking reporting they did on the Nixon White House cover up and other illegalities. Indeed their admission shows commendable humility amid renewed Watergate triumphalism around the 40th anniversary of the break-in. At least, it would show commendable humility, if they hadn’t used a strategy that might be called Nixonian in their attempt to cover up the significance of their inability to answer the primal questions. In their piece, they put the questions they can’t answer in the mouth of a former Nixon flack in order to discredit them. What emerges from ‘Watergate’ is an acute sense of how much we still don’t know about the events of June 17, 1972. … Who ordered the break-in? … What was its real purpose? Was it purposely botched? How much was the CIA involved? … And how did a politician as tough and canny as Richard Nixon allow himself to be brought down by a ‘third rate burglary? This is a masterpiece of misdirection. 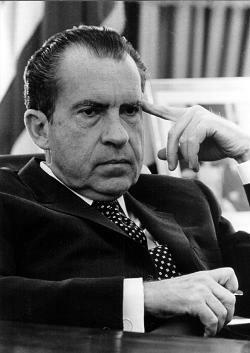 Only “old Nixon hands” who “dismiss the importance of Watergate” care about the origin and motivation of Watergate. Sure, Carl. Sure Bob. Once again, Woodward and Bernstein dismiss our desire to know the full story of Richard Nixon’s role: If he didn’t give the break-in order, then we have to give credence to Nixon’s claim that he was merely a noble defender of over-zealous minions, for whom he eventually, in his fervor to cover up their sins, sacrificed his presidency. On the other hand, if Nixon personally gave the order—and there is reason to believe this, as I argue in my essay—then we have a different picture of Nixon and a different picture of the whole affair. We have a Nixon who was guilty not just of the cover-up but of personally ordering thugs into the opposition party’s headquarters. Not a trivial act. It is transparently disingenuous of Woodward and Bernstein to assert that those who want to know the whole truth are Nixon diehards who “dismiss the importance of Watergate.” Disingenuous because they know that it’s not just old Nixon hands, but journalist-historians such as two-time Pulitzer Prize winner J. Anthony Lukas, for instance, who argued that there were “gaping holes” in the account of Watergate that Woodstein bequeathed us. Those gaping holes being who ordered the break-in, and why. Lukas kept on investigating these questions—and achieved some notable successes, as I recount—while Woodstein were content to rest on their Watergate laurels and call the case closed. Their incuriosity on this front has the whiff of sour grapes as well: Anything they don’t know isn’t worth knowing. But they really need to get back on the case. I think the evidence is out there that will show that Nixon gave the order and why. Prove me wrong, Carl and Bob.